Before you may use certain areas of this Site, you may be asked to indicate acceptance of certain special terms and conditions by clicking on a button marked “OK” or “I agree.” Any special terms and conditions to which you agree will supplement and amend these Terms and Conditions. AQI does not authorize any individual or entity to create a “hypertext” link to this Site without permission. We may, however, if requested, grant a limited, nonexclusive right to create a “hypertext” link to this Site provided that such link is to the entry page of this Site and does not portray the AQI or any of its activities or services in a false, misleading, derogatory, or otherwise defamatory manner. This limited right may be revoked at any time for any reason whatsoever. No framing techniques may be used to enclose any AQI trademark, logo, or trade name or other proprietary information including the images found at the Site, the content of any text or the layout/design of any page or any form contained on a page without AQI’s express written consent. Links to third party sites on this Site are provided solely as convenience to you. If you use these links, you will leave this Site. AQI has not reviewed all of these third party sites and does not control and is not responsible for any of these sites, their content or policies, including without limitation, privacy policies or lack thereof. AQI does not endorse or make any representations about third party sites or any information, software or other products or materials found there, or any results that may be obtained from using them. If you decide to access any of the third party sites linked to this site, you do so entirely at your own risk. You acknowledge and agree that the AQI shall not be responsible or liable, directly or indirectly, for any damage or loss caused or alleged to be caused nu, or in connection with the use of or reliance on any such third party sites. Portions of this Site may provide you and other users with the opportunity to participate in interactive features and submit content, media, and materials for posting on the Site in connection with the same, which may include, without limitation, still photographs, writings, spoken statements, music, audio, video, video recordings, audio-visual works and recordings, portraits, animated and/or motion pictures, caricatures, likenesses, vocal or other sounds, sound recordings, voices, voice reproductions, computer graphics and visual effects (collectively, “User Submitted Content”). To be considered for posting and display to the public, User Submitted Content must meet all the specifications and requirements relating to formatting, compatibility, operating characteristics, and submission. When you provide User Submitted Content you may also be asked to provide some information about you and your submission. This may include, without limitation, such things as descriptive title, some information about the User Submitted Content, length, your location, and/or similar information. Upon your submission of any User Submitted Content for posting and distribution via the Site, you hereby automatically grant to the AQI and its affiliates the unqualified, unrestricted, unconditional, unlimited, worldwide, irrevocable, perpetual, and royalty free right, license, authorization, and permission, in any form or format, in or through any media or medium and with any technology or devices now known or hereafter developed or discovered, in whole or in part, to host, cache, store, maintain, use, reproduce, distribute, display, exhibit, perform, publish, broadcast, transmit, modify, prepare derivative works of, adapt, reformat, translate, and otherwise exploit all or any portion of such User Submitted Content on the site and any other AQI owned or controlled programming services and distribution platforms, whether currently existing or existing or developed in the future (collectively, the “Platforms”), for any purpose whatsoever (including, without limitation, for any promotional purposes) without accounting, notification, credit, compensation, consideration, or other obligation to you, and the right to license and sub-license and authorize others to exercise any of the rights granted hereunder to AQI, in our sole discretion. You acknowledge and agree that neither AQI nor its affiliates shall be required or have any obligation to host, index, display, accept, or use any User Submitted Content (or take advantage of any or all of the particular rights and authorities granted or otherwise available) and AQI may, in its sole discretion, remove or refuse to host, index, display, accept, use or do anything at all with respect to any User Submitted Content. Once you submit or attempt to submit user Submitted Content you shall have no right to prohibit, restrict, revoke, or terminate any of the rights granted to the AQI or its affiliates hereunder. You are not entitled to and you will not receive any compensation or other consideration for your User Submitted Content or any use made of your User Submitted Content once submitted. You also understand and agree that neither all or any portion of your User Submitted Content, nor any commercial, advertisement, promotional, marketing, or other material created by or for AQI that is associated with your User Submitted Content, need to be submitted to you for approval prior to the AQI’s or its affiliates’ use thereof. You hereby release AQI and its affiliates from any and all claims of any rights, encumbrances, liens, claims, demands, actions, or suits which you may or can have in connection with your User Submitted Content, including, without limitation, any and all liability for any use or nonuse of your User Submitted Content, claims for defamation, libel, slander, invasion of privacy, right of publicity, emotional distress, or economic loss. AQI and its affiliates have the right to assign, transfer, convey, license, sub-license, and otherwise transfer, sub-contract, delegate, outsource, or engage third parties to perform or benefit from all or any portion of its or their rights and/or obligations to any one or more other parties, without accounting, reporting, notification, or other obligation or liability to you whatsoever, now or in the future. You also forever waive and relinquish all moral rights now or hereafter recognized in connection with your User Submitted Content and the rights granted to AQI and its affiliates hereunder. We take protection of copyrights, both our own and others, very seriously. We therefore employ multiple measures to prevent copyright infringement over this Site and to promptly end any infringement that might occur. 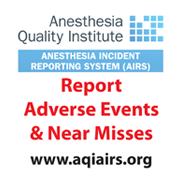 The information, images, programs, and services available through the AQI Site (collectively the “Content”) are the property of the Anesthesia Quality Institute and are protected by copyright and other intellectual property laws. Content provided on or through the AQI may not be reproduced, retransmitted, stored, distributed, disseminated, sold, published, broadcast or circulated in any medium to anyone, including but not limited to others in the same company or organization, without the express prior written permission of the AQI, except as otherwise expressly permitted under fair use provisions of U.S. and international Copyright Law. Fair use provisions of the U.S. Copyright Law permit reproduction of single copies of copyrighted material for your personal, non-commercial and private use. In the event of any permitted use of copyrighted material, no modifications to content or in author attribution or copyright notice shall be made without written authorization from the AQI. Users are not permitted to download excessive portions of content or information from the AQI Site. The use of automated download programs are prohibited. The AQI shall take all reasonable steps to cease such excessive and unauthorized activity and to prevent any recurrence thereof, including terminating your access to the AQI. Any questions about whether a particular use is authorized and any requests for permission to otherwise reproduce, distribute, display or make derivative works from the content may be directed to l.mueller@asahq.org. If you are a copyright owner (or the owner’s authorized agent) and have a good-faith belief that material on the Site infringes one of your copyrights, you may notify us. YOU EXPRESSLY UNDERSTAND AND AGREE THAT NEITHER AQI NOR ANY OF ITS AFFILIATES, WILL BE LIABLETO YOU FOR ANY LOSS OR DAMAGES, EITHER ACTUAL OR CONSEQUENTIAL, ARISING OUT OF OR RELATING TO THESE TERMS, OR TO YOUR (OR ANY THIRD PARTY’S) USE OR INABILITY TO USE THIS SITE, OR TO YOUR RELIANCE UPON ANY INFORMATION OR MATERIAL. IN PARTICULAR, AQI AND ITS AFFLIATED ENTITIES WILL HAVE NO LIABILITY FOR ANY CONSEQUENTIAL, INDIRECT, PUNITIVE, SPECIAL OR INCIDENTAL DAMAGES, WHETHER FORSEEABLE OR UNFORSEEABLE (INCLUDING, BUT NOT LIMITED TO, CLAIMS FOR DEFAMATION, ERRORS, LOSS OF DATA, OR INTERRUPTION IN AVAILABILITY OF DATA), ARISING OUT OF OR RELATING TO THESE TERMS, YOUR USE OR INABILITY TO USE THIS SITE, OR TO YOUR RELIANCE UPON ANY INFORMATION OR MATERIAL, WHETHER BASED IN VERBAL AGREEMENT, CONTRACT, TORT, STATUTORY, OR OTHER LAW, EXCEPT ONLY IN THE CASE OF DEATH OR PERSONAL INJUY, WHERE, AND ONLY TO THE EXTENT, THAT APPLICABLE LAW REQUIRES SUCH LIABILITY. THE REMEDIES PROVIDED FOR UNDER THESE TERMS ARE EXCLUSIVE AND ARE LIMITED TO THOSE EXPRESSLY PROVIDED FOR IN THESE TERMS. This Site, including all software, functions, materials, and information, is provided “as is” without warranties of any kind, either express or implied. AQI disclaims all warranties, express or implied, including, but not limited to, warranties of quiet enjoyment, merchantability of computer programs, data accuracy, system integration, and informational content. AQI does not warrant or make any representations regarding the operation of this Site, the use, validity, accuracy, reliability of, or the results of the use of materials on this Site or any other sites linked to this Site. The materials of this Site may be out of date, and AQI makes no commitment to update the materials at this Site. AQI does not and cannot guarantee or warrant that the files available for downloading from this Site, if any, will be free from infection, viruses, worms, Trojan horses, or other coed that manifest contaminating or destructive properties. AQI does not warrant that this Site, software, materials, products, or services will be uninterrupted or error-free or that any defects in this Site, software, materials, products, or services will be corrected. You understand, acknowledge, and agree that you are assume the entire risk as to the quality, accuracy, performance, timeliness, adequacy, completeness, correctness, authenticity, security, and validity of any and all features and functions of the site, including, without limitation, all information, materials, and services made available via the website. Any articles, press clippings, or other third-party publications (collectively, “Publications”), made available through the Site are furnished by ASA for your convenience and information. Any opinions, advice, statements, services, offers, or other information made available by third-parties, including program hosts, information providers, or any user of the Web site, are those of the respective author(s) or publisher(s) and not of AQI and its affiliates. AQI DISCLAIMS ANY REPRESENTATION, EITHER EXPRESS OR IMPLIED, THAT THE INFORMATION IN SUCH PUBLICATIONS IS ACCURATE OR COMPLETE. Certain links on the Site will let you leave the Site. These linked sites are not under the control of AQI, and AQI is not responsible for the contents of any linked site or any link contained in a link site. These links are provided for your convenience, and the inclusion of any link does not imply a recommendation or endorsement by AQI of any such linked site or the products therein. We reserve the right to assume, at our sole expense, the exclusive defense and control of any such claim, action, settlement or compromise negotiations, as we may request. If you plan to send a message to any address you obtain from the AQI Member Directory or elsewhere on the AQI site that might be considered primarily to be a commercial advertisement or to promote a commercial product or service, keep in mind that, a) you are prohibited from using e-mail addresses obtained from this Site for solicitation and b) it is your responsibility to make sure you comply with the CAN-SPAM Act. This site may include e-mail forums, discussion boards, and file repositories of member-supplied content called “Shared Resources”, some of which may be available only to members and affiliates of AQI. AQI does not control or receive any financial benefit from the messages, information, software, files, or other materials posted on the Email Forums (the “Postings”). AQI neither condones nor is responsible for any Postings. AQI is an online service provider. If you believe that any Posting uses copyrighted material in a manner that constitutes copyright infringement, please notify our Designated Agent immediately. AQI does not scan any Postings for viruses or other undesirable components and will not be responsible for any harm, inconvenience or damages to you or others that may result because a Posting contained viruses or other undesirable code before proceeding with your upload. All Postings are made available to the interested community of participants in the Email Forums, which includes AQI members (and may include affiliate members and vendors). Postings will not be treated as confidential. Depending on the information you provide, your Postings may potentially be identifiable to professional or business matters involving you or your practice. We request that you do not post information in the Email Forums regarding any specific situations or matters that you consider to be confidential. You may not forward any Postings to any third parties who are not subscribers to the Email Forum or members of the AQI, without the prior written permission of the individual who posted the particular Posting. AQI reserves the right at all times to disclose any Posting and the name of the individual who posted the Posting when we believe disclosure is appropriate to comply with the law (or a court order or subpoena); to prevent or investigate a possible crime or other violation of law; to enforce these Terms and Conditions, or to protect your rights, property or safety, or the rights, property or safety of AQI or others. All Postings to the Email Forums must contain the author’s Email Forum user name; no anonymous Postings will be permitted. If you do not wish for your e-mail address to be displayed publicly, then you should not send any Postings to the Email Forum. All Postings to the Shared Resources must contain the submitter’s name and organization name. AQI reserves the right to refuse any such requests in its sole discretion. 1. AQI does not collect data that directly identifies a patient or facility. 2. AQI does not directly report on or publish any data about an individual patient or facility to any entity except the AQI participating practice that submitted the data. 3. AQI will consider individual requests for customized reports and/or data based on available resources. Requests should be submitted to the Data Use Committee by emailing askaqi@asahq.org. 4. AQI is a non-profit charity organization, and as such, we do not pay indirect costs for outside services that we contract for. Indirect costs are defined as expenses that benefit common activities such as utilities; existing IT equipment, maintenance and depreciation; insurance; administrative supplies and support; and other shared resources not directly attributable to a project. 5. For purposes of funding research, AQI caps physician salaries according to the National Institutes of Health (NIH) salary cap.